Today in Masonic History Robert Leo "Bobby" Hackett. passes away in 1976. 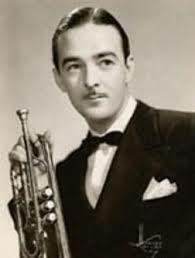 Robert Leo "Bobby" Hackett was an American jazz musician. Hackett was born in Providence, Rhode Island on January 31, 1915. Hackett made his name by being a follower of the legendary coronet player Bix Beiderbecke. In 1938, Benny Goodman would hire Hackett to perform "I'm Coming Virgina", a solo which Bix had made famous, at Goodman's Carnegie Hall concert. Also in the 1930's, Hackett played with an orchestra which backed the Andrews Sisters. In 1939, Hackett got the opportunity to establish his own band when the talent agency MCA approached him with an offer to back a band he was leading. Unfortunately the band failed and Hackett found himself in massive debt to MCA. To earn the money he needed to pay off his debt, he would join two bands, one led by Horace Heidt and the other by Glenn Miller. At the time Hackett joined Miller's band he had just had dental surgery and his lip was in no condition to play for any length of time. He would be able to squeeze in some solos though. Miller as a favor to Hackett kept him in the band playing guitar. In 1940, Hackett can be heard on soundtrack for the movie Second Chorus with Fred Astaire. In 1947, his dreams came true when he was asked to play in Louis Armstrong's Town Hall Jazz Concert. In 1952, Hackett would become a household name when Jackie Gleason hired him to work on some of Gleason's earlier mood music albums. The album, titled Music for Lovers only would go gold as would the next 10 albums Gleason produced. Hackett would appear on 6 of those 10 albums in addition to the first. In 1954, Hackett would appear as a regular on the short lived ABC variety show The Martha Wright Show, the show also went under the name of The Packard Showroom. In the mid to late 60's, Hackett would tour with Tony Bennett. This would include two European tours. In the early 70's Hackett would preform with Dizzy Gillespie and Teresa Brewer. Hackett passed away on June 7th, 1976. Hackett was a member of St. Cecile Lodge No. 568 in New York City, New York.